Hydronic Underfloor Heating Market size was valued over USD 3 Billion for 2016 and is set to grow over 8% by 2024. 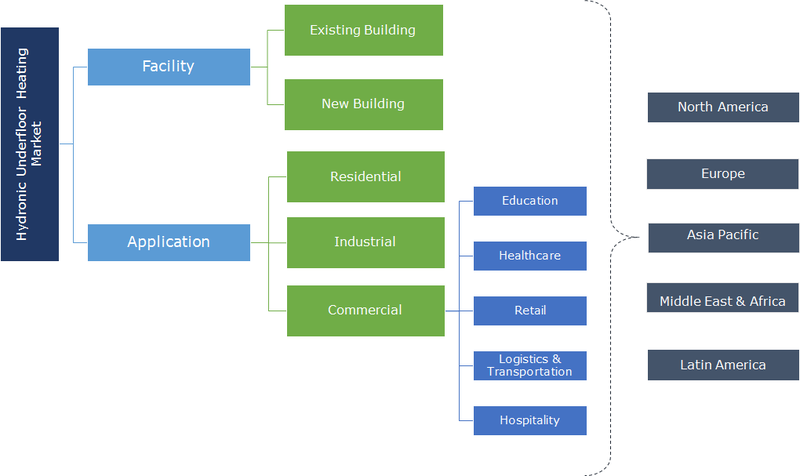 Introduction of standards toward the adoption of energy efficient systems with ongoing measures toward energy conservation will upsurge the hydronic underfloor heating market size. The European Union (EU) has introduced the Energy Performance of Buildings Directive (EPBD) which states that all new buildings should be nearly ZEB by 2020. As per European Commission, gross inland consumption of energy within EU-28 accounted for 1627 million tons of oil equivalent in 2015. Cost efficiency, comfort, equivalence with other heat sources and minimal design considerations are some of the prominent features which makes its adoption preferable over available alternatives. 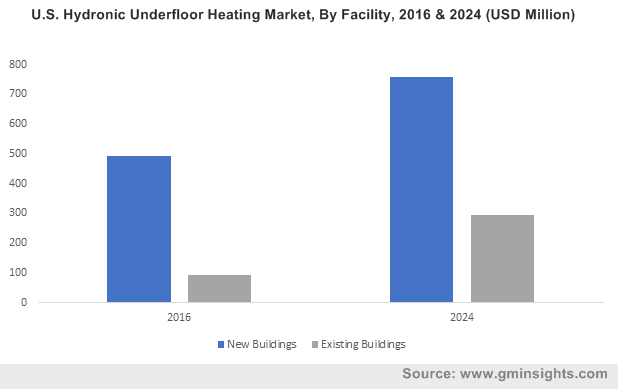 Significant economic transformation owing to rapid industrialization and commercialization will positively influence the hydronic underfloor heating market. As per the World Bank, in 2015, over 50% of the Asia Pacific population was residing in urban areas, which was greater than the combined population of the U.S. & Europe. Internal migration by the rural population towards urbanization to improve living standards will further embellish the product demand. Growing concerns toward increasing energy cost coupled with demand for reliable and sustainable heating source across residential and commercial sectors will stimulate the hydronic underfloor heating market share. According to EIA, the energy consumption from the residential sector grew from 15.8 squads in 1980 to 21.5 squads in 2014 and commercial sector witnessed an increase up to 18.0% in 2013 from 10.6% in 1980. New building hydronic underfloor heating market size is predicted to exceed USD 4 billion by 2024. Deployment of concrete floors along with focus towards construction of green buildings will foster the product demand. As per United States Green Building Council (USGBC), the number of certified projects in the U.S. rose from 296 in 2006 to 33,269 in 2016. Existing buildings will growth owing to favorable government measures to curb carbon footprints. Increasing demand for a high-quality living has encouraged architects and building owners to look for modern and advanced heating systems. Reduction in installation cost coupled with advancement in technology will drive the hydronic underfloor heating market. Residential hydronic underfloor heating market is set to witness gain over 9% owing to shifting trends towards improved living standards and rising awareness to reduce energy bills. Adoption of modern technologies on account of rising disposable income of individuals will stimulate the product penetration. Efforts towards improving air quality along with increasing demand for high-level of comfort will further augment the industry landscape. Commercial sector will witness strong growth subject to rising investments toward the construction of hotels, offices and educational institutes. Low flow temperatures of warm water make its adoption preferable over available counterparts. Germany hydronic underfloor heating market is set to witness growth over 8% by 2024. Increasing demand for energy efficient space heating along with government initiatives to limit emissions will stimulate the product penetration. Introduction of Energy Saving Ordinance in the country toward energy efficient buildings and refurbishment activities will further complement the business growth. U.S. hydronic underfloor heating market is predicted to exceed USD 1 Billion in 2024. Efforts toward improving air quality, reducing greenhouse gas emissions, low energy bills and increasing energy security will positively influence the business growth. California has introduced Building Efficiency Standards to regulate the energy use by 28% in new homes, enabling consumers to save USD 31 per month on energy bills. China in 2016 accounted for over 30% of Asia Pacific hydronic underfloor heating market. Government initiatives toward the adoption of energy efficient heating system along with rapid urbanization will augment the industry landscape. As per Eleventh Five Year Plan, newly designed buildings in China should stick to a design standard of 50% energy conservation. As per International Energy Agency, China has reduced 1.2 billion tons of carbon emissions subject to strict government policies. Notable players in hydronic underfloor heating market include Warmup, Uponor Corporation, Honeywell International, Emerson Electric, Danfoss, Robert Bosch, Sensata Technologies, Siemens, Schneider Electric, Pentair, Nexans, Mitsubishi, REHAU, Amuheat, H2O Heating and Hunt Heating. Major players are focusing on new product developments along with mergers and acquisitions to gain competitive advantage. In 2015, Mitsubishi Electric acquired DeLclima S.p.A, with the objective of synergizing and strengthening its commercial heating, air conditioning (HVAC) and ventilation business worldwide. The acquisition will allow the company to strengthen its business portfolio, and amplify its market presence. These systems use warm water for heating purpose and occupies less space as it is installed beneath the floor. Heat pumps and boilers are usually employed to provide warm water. The low flow temperature of water makes its installation feasible over electric UFH. The system comprises of heat pumps or boilers, primary pipe network, manifolds, pipe loops and controller switches. Wet UFH acts as an invisible source of heat subject to the installation beneath the floor surface.